Can you identify companies no longer in business or have fallen as market share leaders? Think about Blockbuster, Toys R Us, Sports Authority, Sears . . . and consider companies in your industry that have dropped. What happened? These companies didn’t pay close enough attention and/or didn’t respond well enough to the competition. They went from owning a dominant market share in their space to little or no market share. Maybe they tried to differentiate but likely had no competitive advantage. For me, you have a “competitive advantage” when you have something your competitors don’t, thereby placing your company in a favorable business position. This is different than “differentiation” (no pun intended). Understand your true competitive advantage, then aggressively exploit it. If you don’t think you have one, don’t let time slip by before you create one. Understand your true competitive disadvantage, then get on with closing the gap between it and your competitive advantage. Which of our products and/or services give us a competitive advantage? What makes us think this advantage is real? 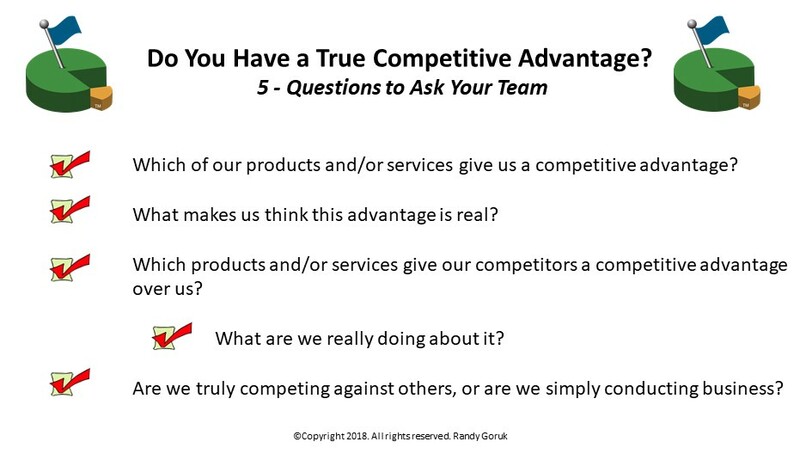 Which products and/or services give our competitors a competitive advantage over us? What are we really doing about it? Are we truly competing against others, or are we simply conducting business? As leaders, we need to pay attention to our true competitive positioning. If we’re not dominating our market, then we need to change or possibly reinvent our business…now. Companies that have a true competitive advantage flourish. And those that don’t, don’t. Contact me if you’d like an unbiased, outside perspective that critically evaluates your true competitive advantage?